AMSA is excited to announce that registration for the 72nd RMC is open! The host and technical planning committees are preparing a variety of activities. More information regarding the technical program, schedule of events, registrations fees, hotels and more is posted online. So, save the date and register today to join us for the AMSA 72nd RMC in Fort Collins, CO. Early registrants (before May 20) receive a $100 discount off regular rates. The early bird registration fee is $675 for AMSA members, $325 for student members and $950 for nonmembers. For more information regarding the AMSA 72nd RMC please visit: http://www.meatscience.org/rmc. AMSA is happy to announce the room block for the AMSA 72nd RMC is OPEN! The Embassy Suites by Hilton Loveland Hotel Conference Center has been selected as the 2019 RMC host hotel. The Sunday, Monday, and Wednesday RMC program will be held at the Embassy Suites by Hilton Loveland Hotel Conference Center and the Tuesday RMC program will take place on the Colorado State University Campus. It is very important to reserve your hotel before May 29, 2019. For more information and to make your reservations, click here! Are you up for some breathtaking views, remarkable landscape, mouthwatering food, and an educational program that you will not find anywhere else? If so, make plans now to "Meat us in the Rockies" as Colorado State University and JBS USA, Food Company host the AMSA 72nd RMC June 23-26, 2019 in Fort Collins, CO! A big thank you goes out to Colorado State University and JBS USA, Food Company for hosting the 2019 RMC site visit last week, September 23-25. Your warm welcome and excitement for the upcoming RMC was remarkable! The 2019 RMC host committee has put a lot of time and effort into making sure that every event at the upcoming AMSA 72nd RMC will be an unforgettable experience and an RMC that you will want to load up the family and bring them along for a fun filled family vacation. The pre-RMC site visit is an important time for the planning committee to come together and bring the vision of the 72nd RMC to life. 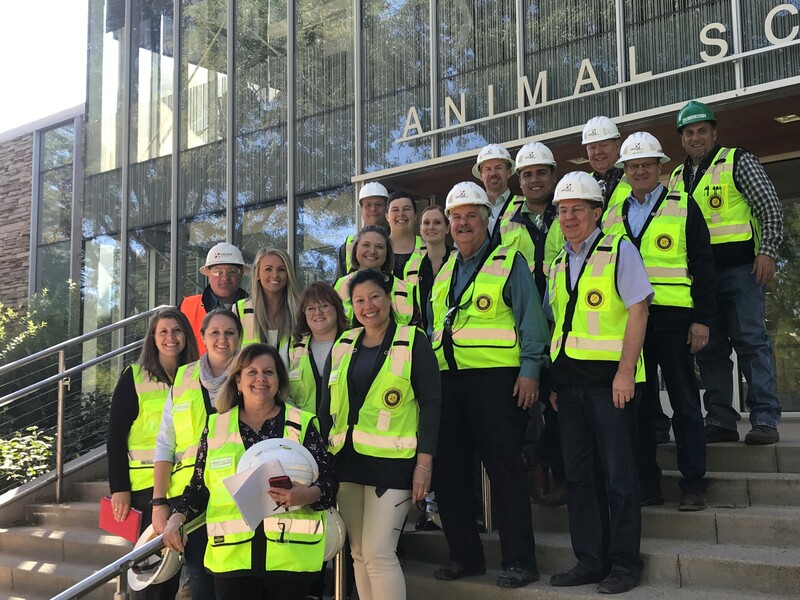 Tommy Wheeler, chair for the 2019 RMC, the AMSA staff, and the co-chairs for the 2019 technical program spent a few days looking at the meeting spaces, reviewing the RMC survey comments, discussing the program suggestions, and ironing out details to make the technical program for the AMSA 72nd RMC one that you will not find on any other conference agenda. Attendees will be starting out at the Embassy Suites by Hilton Loveland Hotel Conference Center Monday morning for the Keynote presentation, AMSA International Lectureship Award presentation, concurrent sessions and ePoster viewing, not to mention great opportunities for networking! Tuesday morning, all attendees travel to the Colorado State University campus for the "Reciprocation Fair" which will be a full day of educational programs. Attendees will have the chance to tour the JBS Global Food Innovation Center in Honor of Gary & Kay Smith and participate in some hands-on reciprocation sessions. Then Wednesday, we will head back over to the Embassy Suites by Hilton Loveland Hotel Conference Center for a powerful keynote presentation and a variety of concurrent sessions and workshops. Over the next few months, make sure to watch for eNews announcements regarding the Keynote speakers, concurrent sessions, and the Wednesday sessions. This is going to be one RMC you will not want to miss out on OR leave early! Details on the host hotel, social events, and technical program will be released over the next few months, so make sure to read your eNews and go online! he American Meat Science Association (AMSA) is pleased to announce, Dr. Scott Updike, Robert Hanson, and Dr. Bradley Marks will be the featured speakers at the AMSA 72nd Reciprocal Meat Conference (RMC) Symposium entitled “Thermal Processing,” on Wednesday, June 26 in Loveland, CO. The American Meat Science Association (AMSA) is excited to announce that Dr. Surendranath Suman has been selected as the 2019 AMSA International Lectureship Award winner. Join us for the AMSA 72nd RMC!